Werner Herzog has one of those hypnotic voices that draws you in to whatever subject he happens to be talking about. And with Herzog, it's safe to assume that whatever subject that is, he'll be looking at it from a point of view both unusual and insightful. In his latest documentary, LO AND BEHOLD: REVERIES OF THE CONNECTED WORLD, the subject Herzog turns his gaze (and voice) to is the internet. 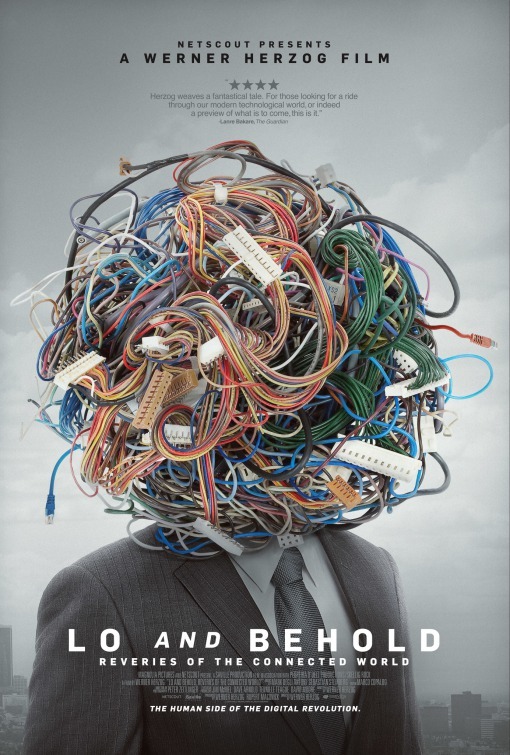 Although he starts with a rough history of the internet, and some scientific explanations of what it is and how it works, what Herzog is most interested in here is the ways being online have affected human beings. And while he doesn't completely ignore the positive possibilities of a connected world, Herzog seems more interested in the dark side. Among the issues Herzog explores: a family tormented by grisly pictures of their daughter's death in a car accident, sent anonymously by email; the ease by which hackers can acquire sensitive information, not because the computer systems are faulty or easy to infiltrate, but because of the human factor; and the ways in which online interactions can become so addictive that real life is neglected. On a more positive note, we see the potential of the web for communal problem solving, and ways in which robots might help us lead more fulfilling lives. But this is Herzog, so it would be foolish to expect the film to reach a conclusion rooted in happiness and sunshine. Visually there's not much to see here. As is typical in his documentary work, Herzog doesn't go in for the sort of attention grabbing recreations and visuals of an Errol Morris. But even if LO AND BEHOLD is your standard "parade of talking heads" documentary, Herzog's take makes it distinctive and compelling. 3 out of 4 stars.